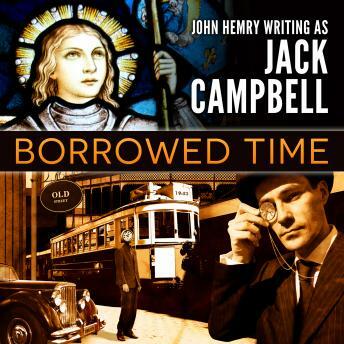 New York Times bestselling author Jack Campbell takes listeners on an incredible journey through time in this collection of seven stories. The centerpiece of Borrowed Time is 'Betty Knox and Dictionary Jones in the Mystery of the Missing Teenage Anachronisms.' When you've traveled through time and are stuck in the body of your fifteen-year-old self, it isn't the best time to have some other time travelers looking to kill you. Especially when the person who's supposed to be keeping an eye out for the bad guys is stuck in his own fifteen-year-old body. In four interlinked short stories, temporal interventionists Tom and Pam meet cute, then work together to solve some of history's greatest mysteries. And in 'Joan,' Kate is a time-traveling researcher who's gotten a little too close to Joan of Arc both in time and emotionally. With no distance, scientific or otherwise, what will happen when she has a chance to rescue Joan from being burnt at the stake? Our journey through time concludes with 'Crow's Feat,' when a skeptical writer goes back to Elizabethan England to discover the true author of Shakespeare's plays.